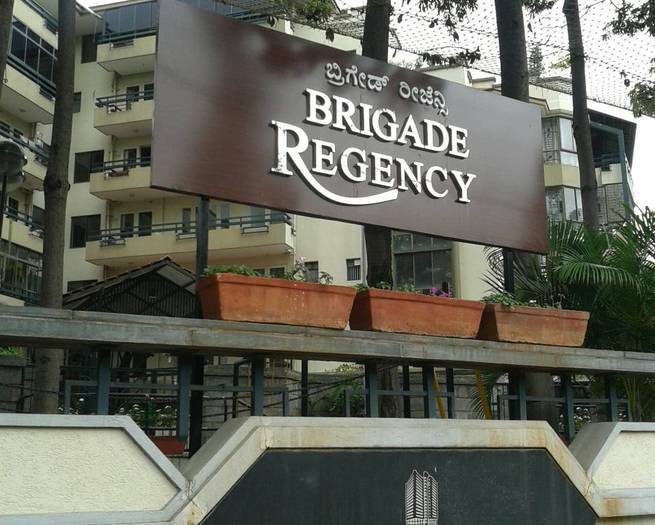 My connection with Brigade Regency (BR), an apartment located in Malleswaram, is an organic one. This is where, as a tenant, I started segregating my household waste into six categories. Being one of the very few communities that took the garbage crisis seriously back in 2007-08, it went on to find holistic solutions for all streams of waste before “sustainability” became a much-abused word. Till then, I was familiar with compost prepared in farmlands which do not involve too many intricate processes or lab-produced microbes or soil scientists. But when the BR facility manager gifted the residents with a packet of compost prepared inhouse, it resummoned my childhood memories of playing next to huge mounds of compost piles where animal dung, straw and other farm rejects conspired together to bring about this intriguing black mixture called compost. What I held in my hands was my own contribution, albeit in a small way. But still, that gave me a high. At BR, the system involves a little bit of engineering to build the cement tanks and fix a diffuser network that blows air to keep the aerobic process going. There are three composting tanks catering to 68 homes. The size: 3ft H* 5ft B* 7ft L. The capacity of each tank: 750 kgs. On top of each tank, there are three trays filled with charcoal. At about 9 inches off the floor, there is a false floor at the bottom of the tank which is nothing but a strong metal mesh base on which the waste rests. Underneath this mesh base, there’s a diffuser network which blows air into the composting mass. It is also fitted with a water inlet to supply fresh water to clean the tank floor. There are two storage tanks perching alongside these tanks. 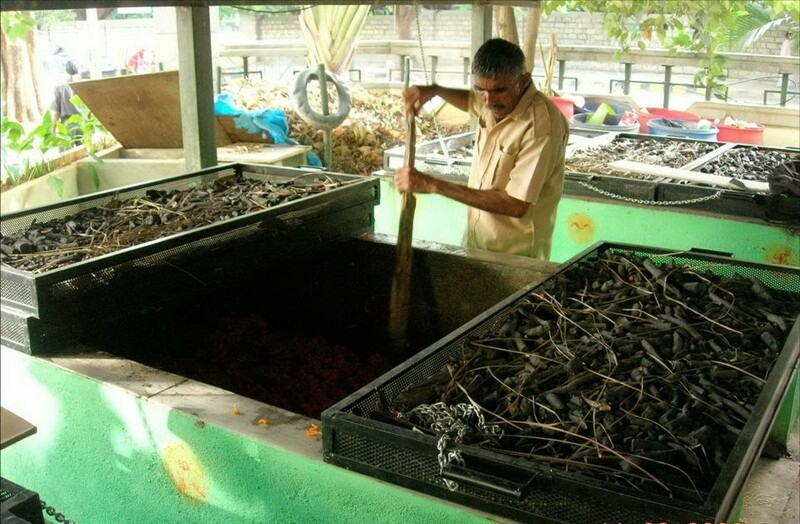 These are used to store dry leaves and the harvested compost. To construct three composting tanks and two storage tanks, you will need around 200 sq.ft. Fresh waste is being added to the tank. Kitchen waste and dry leaves are alternately layered in the tank. The process is rather “passive” involving minimal human interference. That’s what makes this method worth considering. Once the housekeepers pick up the segregated waste, they layer it evenly on the mesh base. Ten teaspoons of accelerator—which is nothing but a combination of three types of bacteria and two types of fungi—is sprinkled every day (more later). Later, twice the amount of dry leaves goes in. The community has a garden which supplies ample carbon-rich dry leaves to complement the nitrogen-rich kitchen waste. The housekeepers place the charcoal trays on top of the tank and call it a day. No shredding done. It takes nearly 45 days for one tank to fill up. Once full, the staff moves on to the second tank. Likewise, it takes approximately 90 days for two tanks to fill up before the third one becomes active. By the time the third one fills up, the waste in the first tank is fully processed and ready to be harvested. “The first tank is then cleared and cleaned and readied for loading again,” adds Sandya. One of the staff members switches on the air-blower every day without fail. When sufficient air passes through the composting mass, it obviates the need to turn the pile. Secondly, it tackles odour issues effectively. These are the masonry compost tanks covered with removable steel mesh racks. These trays have to be fabricated according to the size of the tanks. The charcoal in the racks absorbs any odour from the wet waste. Charcoal is used in this process to absorb the gases coming out of the composting mass and eventually, tackle odour problems, if any. The trays, filled with charcoal, block the view and also act as a barrier to rodents and other insects from accessing the substrate. In other words, it’s a rodent- and odour-free solution. Charcoal needs to be changed once a year. Since there is air circulation only from the top, air-blower is a must for this process. To be precise, air-blowing is carried out for about 30-45 minutes for the fresh ongoing tank and for about 15-20 minutes for the remaining two. Most often, the duration is ​season-dependent. Windy days require much less intervention. Twice a week, the tank floor is washed with fresh water supplied through the inlet. 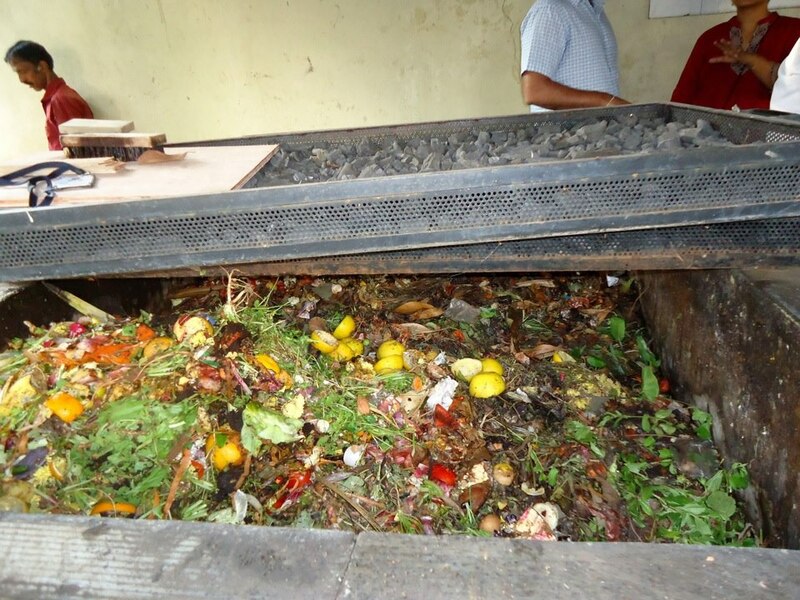 All these small tasks are essential in maintaining a hygienic composting unit. …through this pipe, into the space below the mesh for 45 minutes every day to provide aeration for composting. A bucket is placed in this pit below the small pipe jutting out to collect the leacheate that flows out. This might dampen your spirit! Convincing residents to separate vegetarian leftovers from non-vegetarian can be an uphill task. The system doesn’t take in mango seeds or jackfruit skin either. Perhaps, only perhaps, a shredder might help here. The reason why we avoid the above items is the long time they need to decompose although jackfruit skin is relatively easier if shredded. Similarly, if you are short of dry leaves, a cocopeat-based accelerator will help. Only a well-aerated, roofed area suits this method. You cannot build the tanks in basements as it might trigger odour issues. If you plan to use the terrace, then make sure water-proofing is done properly and the plumbing is perfect. Sandya also advises paying attention to load bearing issues. This system caters to about 70 homes at BR. Total cost for building 3 composting tanks + flooring: Rs 75,000. Total cost for building two storage tanks, an air-blower and a 0.5 hp motor: Rs 25,000. A suggestion: You can avoid building the storage tanks and use blue plastic barrels to store dry leaves and the harvested compost. The cost of the accelerator and power expenditure for air-blowing. The BR management insists on integrating the entire workforce in these activities. So, no extra hands hired for composting or air-blowing. The staff takes turns and spends a little time and effort each day to run the system efficiently. Once you get professional help to build the tanks, you are pretty much on your own. This system helps you remain independent of outside assistance like vendors to keep it going. BR management used to spend Rs 25,000 upwards on compost and fresh red soil each year for its garden. But now, the inhouse compost is fed to the garden as topsoil, especially for seasonal flowering beds. Red soil is now being bought in very small quantities only once a year, as against thrice a year earlier, to be used as topsoil for lawns and some evergreen spots. “The cost reduction is significant,” says Sandya. Whenever we talk about compost, we have to always look at the bigger picture. There are so many invisible benefits one can get just by processing the wet waste within the community complex. In my view, it is quite myopic to calculate only capex and opex and leave aside long-term benefits. Apart from enriching the soil naturally, compost gives you a chance to avoid pesticides and chemical fertilisers completely. These two can harm your living space to no end and also pollute soil, air and groundwater. Secondly, compost, in general, brings down water consumption significantly especially when added as topsoil to the garden. It is spongy and holds the moisture well especially during summer. It’s hard to put a number on these benefits. That’s precisely the reason why one should pursue in situ wet waste management and never give up. Contact details: Sandya Narayanan, sandyavn@gmail.com. This entry was posted in Community Composting, Endlessly Green and tagged Brigade Regency cement tank composting, CCM12, community composting method, in situ wet waste management, Malleswaram Brigade Regency. Bookmark the permalink. amazingly detailed n well written as always ! kudos Savita !! !